This post contains major spoilers for the ending of Terminal. There’s something delightful about Mike Myers’ appearance in Terminal. Though the film itself runs all over the map -- twisting so many times it knots itself into a contorted mess, and packing in more cinematic references than it knows what to do with -- Myers draws you in and holds your attention. It’s his first onscreen role in nearly a decade, and certainly meatier than his cameo as a British general in Inglourious Basterds. The film, directed by Vaughn Stein, takes the neon killer aesthetic popularized by John Wick and Drive and turns it up to 11. Initially, it’s not clear exactly where Myers’ character, a hobbling janitor with crooked teeth, fits into the picture. The world of Terminal is one of contract killers, or at least people on close terms with death. Though the janitor is certainly quirky enough to fit in with the rest of the colorful cast, he’s not a killer -- or so we’re led to think. 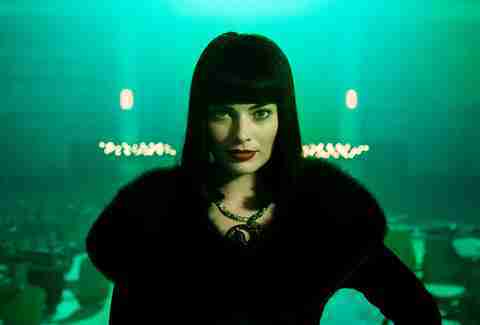 For a while, it seems like femme fatale Annie (Margot Robbie) is at the center of the spider’s web. She’s been playing Alfred (Max Irons) and Vince (Dexter Fletcher) against each other, and Bill (Simon Pegg) against himself, so as to get into the good graces of one masterminding "Mr. Franklyn," heard only as a voice on the other end of the phone. But then come the twists: As it turns out, there’s been a reason why we’ve been seeing the janitor all over the place. He’s been sent by Mr. Franklyn to give Annie a hand, or rather, to keep tabs on her. And when he limps back to the door labeled as the janitor’s closet after all three of Annie’s targets have bitten the bullet, it’s not to a closet filled with mops and cleaning supplies, but a surveillance room. Though it’s a twist you may have seen coming, Myers’ physical transformation once his character is left alone is a refreshing reminder of just why he’s so fun to watch. The janitor and Mr. Franklyn are polar opposite personalities, and Myers ping-pongs from one to the other with such ease that he doesn’t even really have to take off the janitor's prosthetics or false teeth for the flip to hit home (though, of course, it helps). Once Franklyn changes into tailored, all-black clothing, the level of palpable evil is tempting to compare to certain other "evil" roles he’s played. But Terminal's sweeping and rocky tone, brandishing an amalgam of influences and storylines without seeming to be able to settle upon just one, derails that inclination. There are a few other twists that follow, but none are quite as fun as the turn from hapless fuddy-duddy to cold-blooded killer. There’s a spooky, supercilious quality to Franklyn that Myers nails; it makes you hope that his return to acting will last. (To date, he’s also appearing in the upcoming Freddie Mercury biopic Bohemian Rhapsody.) It’s the first time we’ve seen Myers in a role without excessive prosthetics or comedic edge in nearly two decades. He makes a terrifically fun "serious" villain, and it’s always a joy to see actors take on roles that are drastically different or opposite to what they’re known for. It’s just a pity that the movie itself isn’t quite as thrilling.